The spring and summer of 2017 have long since ridden off into the sunset, and the memories of my first spade into the tired old lawn of my new garden are beginning to fade. So, what better way to beat the February chills or driving myself crazy with wanting to sow every seed, than to look back at my five favourite vegetable successes that grew in my new garden. Having never grown a squash before, and rarely tasted them in anything other than soups, I decided to grow 2 Squash Spaghetti Stripetti seeds. I greatly underestimated what these plants could do, although the wind sorted one of them out in just a few hours of planting it out into my new raised bed. I sowed a replacement, but really didn’t need to. 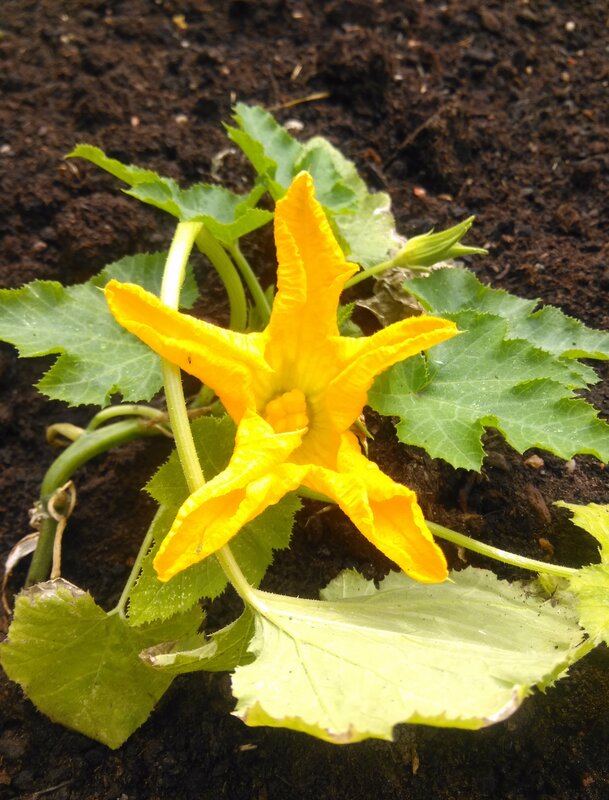 Within only 6-8 weeks of sowing the first one, I was already expectantly watching the first of the squashes form under a mass of leaves and tangled stems. 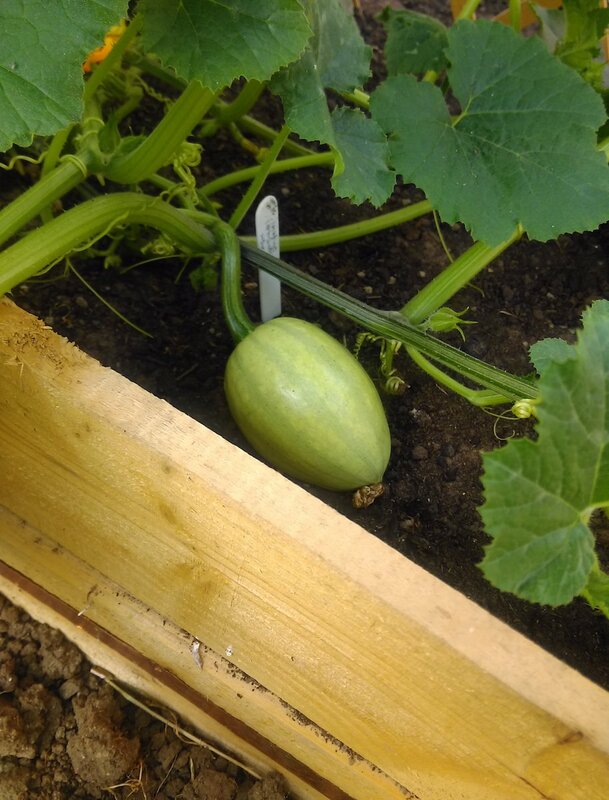 The first Squash forming after about 6-8 weeks of sowing. I ended up with the original plant meandering and clinging to all other plants (including the lawn), with a radius of about 20 feet. By the time that the plant had peaked, it had given me about 15 edible big plump squashes. I swiftly learnt how to roast them up and have enjoyed eating their soft, spaghetti-ish, kind-of sweet yellow flesh. I still have three of these in my kitchen – they store really well. One of the Courgette ‘Black Beauty’ plants on flower. They went er.. bananas. The Courgette ‘Black Beauty’, just like the namesake horse, galloped along and took over my diet for about 3 months, allowing me to legitimately infiltrate the courgetti fad crowd with my tricky-to-clean spiralizer gadget. I’d tried growing these over the years with intermittent success. In this new garden though, for some reason I thought 6 plants would be ok. This gave me heaps of courgettes resulting in a great soup recipe, and new-found friends at work (gardening really is sociable!). Courgette, Potato, and Cheddar Soup – one of the tastiest ways to reduce my courgette glut. Considering that the seed ‘should have’ been discarded about 8 years previously, they did very well. 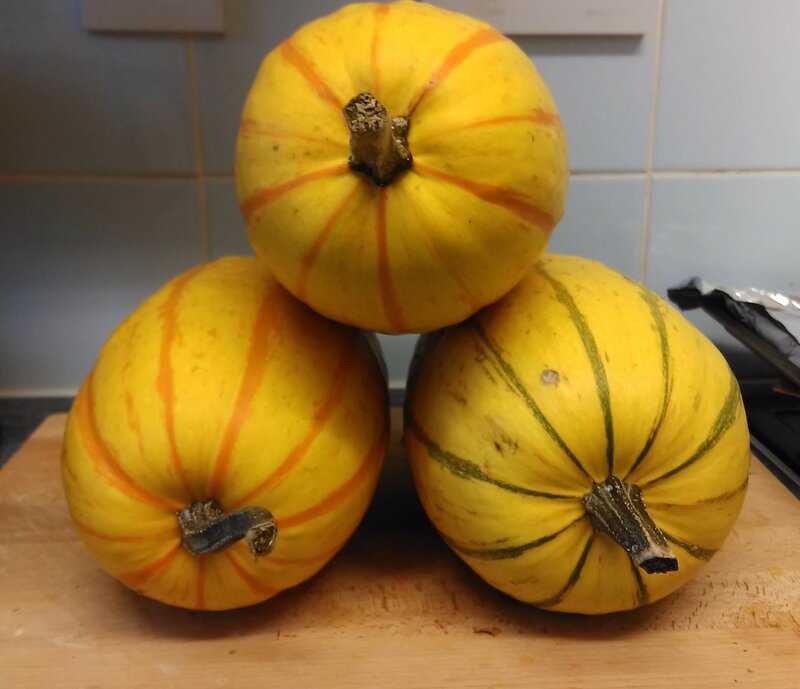 After drowning in courgettes, and the plants experiencing mildew that eventually suffocated the courgettes and the marauding squash plant, I pulled up both after a long and happy harvest. I kept a tally, but gave up at the end of Week 7’s harvest. At that point, i counted a total of 45 courgettes, weighing a cumulative 15.5 kilos (that’s 15,500 grams – the equivalent of just less than 1 London Bus). Just a few of the French Bean ‘Blue Lake’ beans that cropped well in the new garden. 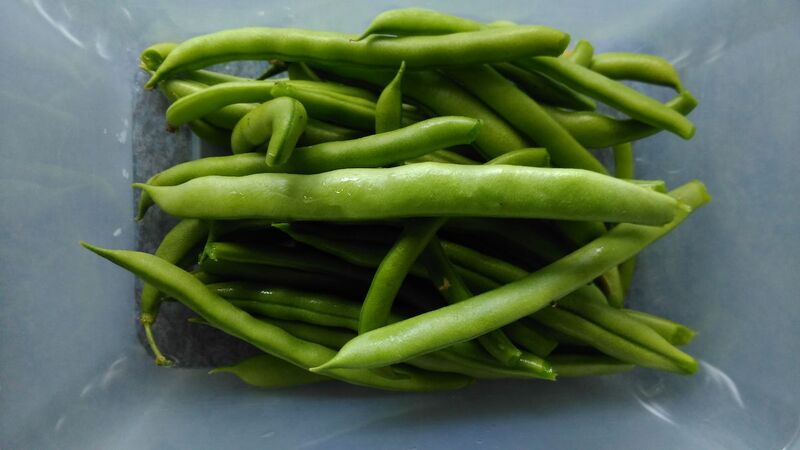 This was probably my best harvest yet, and these French Bean ‘Blue Lake’ beans soon took to the wigwam and cropped. They were the second plants to be planted out into my new garden, as the seedlings had spent most of April crawling around my old house’s windowsills desperate to be planted out whilst solicitors did their job. My French Bean ‘Blue Lake’ seedlings had been desperate to be planted out in 2017, so they were 2nd out, in week 1! Heavy assaults from snails were seen off with some magic sweets, enabling me to have many harvests right up to the frost. I’ll definitely continue growing these, as the beans are so tasty, and I love to pop a few in a stir fry. 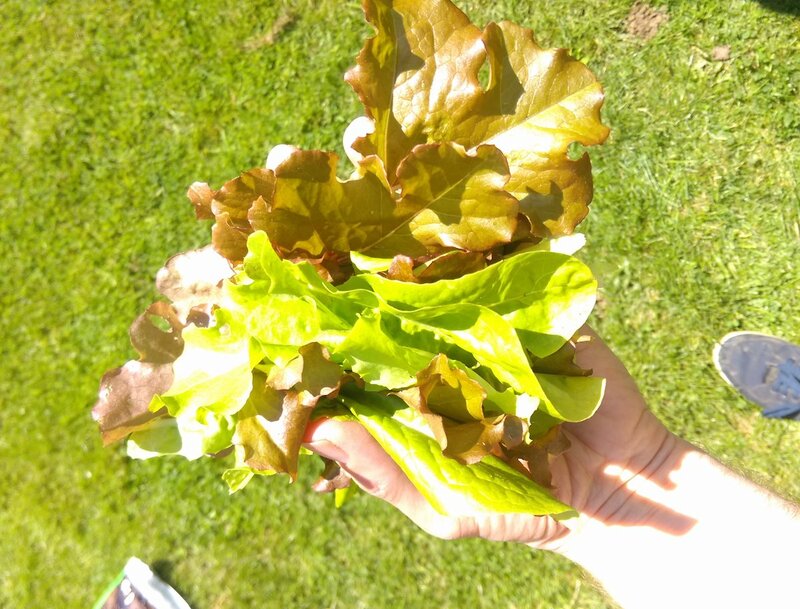 The mixed Salad Leaves have been lush and delicious, and I’ve enjoyed picking them in the morning sunshine before work. These did really well, considering that they were supposed to have been sowed ‘before 2012’. They were desperate to be planted out when they were filling up the windowsill of my old house, so they were the first plants in – just a few days after getting my new house keys. 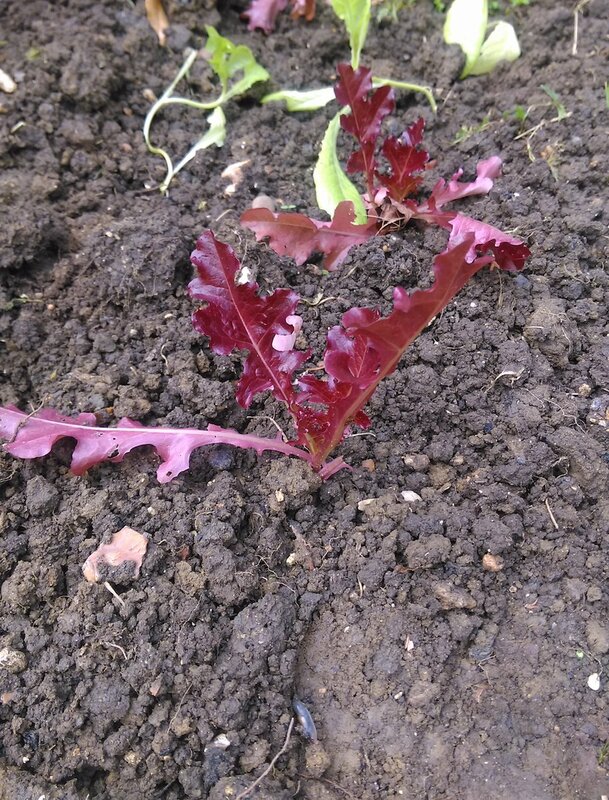 The slugs don’t seem to like these red-leafed lettuces. I’ll grow some more. I grew a mixed range, and I soon realised that one of the red leaf varieties did not appeal to slugs and snails. I think I’ve identified the variety as Lettuce ‘Red Salad Bowl’ (ingenious name, right? ), and will be growing it again in 2018. 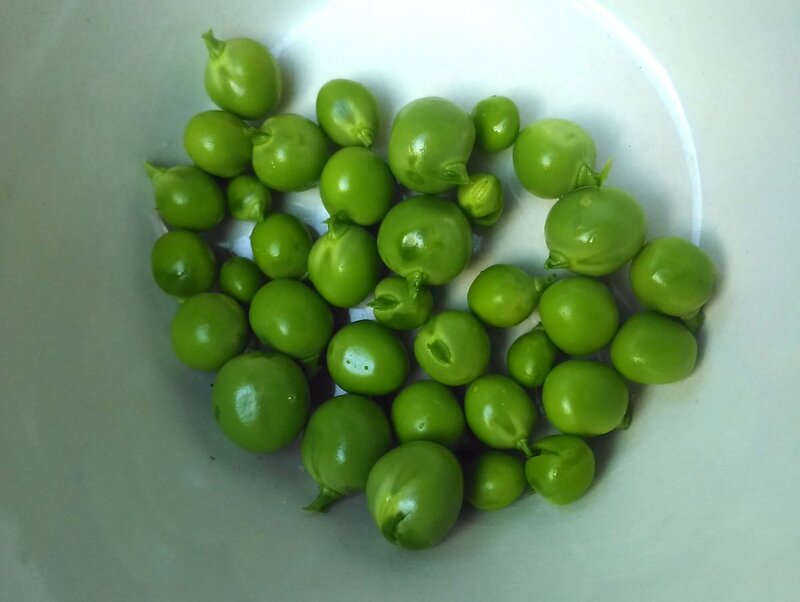 Last year, I returned to growing one of my first garden successes from when I was a child – Peas. Armed with a packet of Pea ‘Alderman’ seeds, and a newly erected fence, I sowed my line. My one and only handful of Peas ‘Alderman’ from my 2017 garden. Delicious. They germinated fast, but the woodpigeons and slugs were fast too. I managed to pop some wire over them but they’d already taken heavy slug damage. 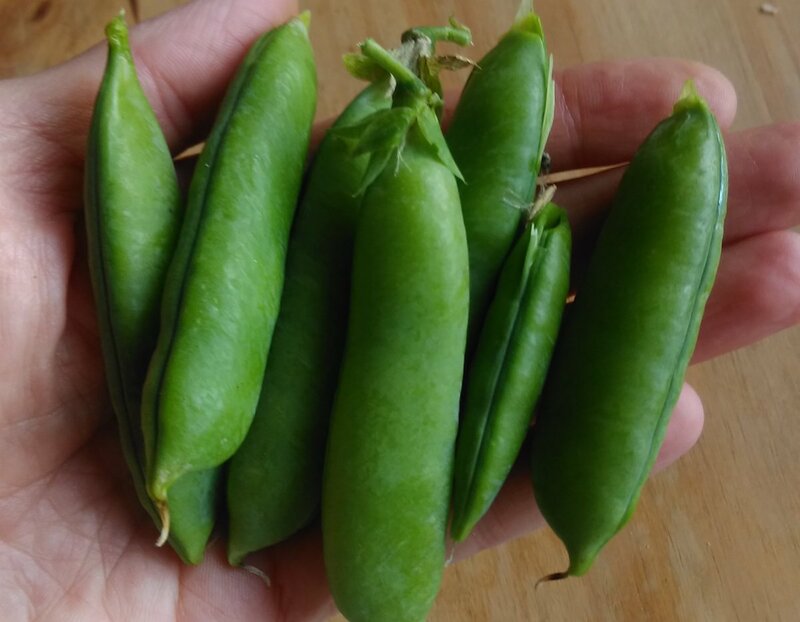 I managed a harvest though – a handful of pods – and well, a mouthful of fresh peas. They were delicious, but brief. My 2017 Pea harvest. That’s it. Baby steps, Andrew. Baby steps. I hope to improve this in 2018, and be two steps ahead of my pea-nibbling foes. So, those are my vegetable highlights of 2017 – all of these grew from seed, and were planted out in my new garden. What did you grow in 2017? Did you have any vegetable growing successes in 2017? What are you planning to grow in 2018? Let me know in the comments below. As ever, happy gardening (or simultaneous seed catalogue browsing and dreaming). I’ll post the garden review of my favourite flowers in a few days, but for now – thanks for reading.